Because of weather, tonight’s all-American Concert on the Square by the Wisconsin Chamber Orchestra has been moved from the Capitol Square indoors to the Alliant Energy Center (below). Because of rain, it had been postponed from last night until tonight. The concert will start at 7 p.m. 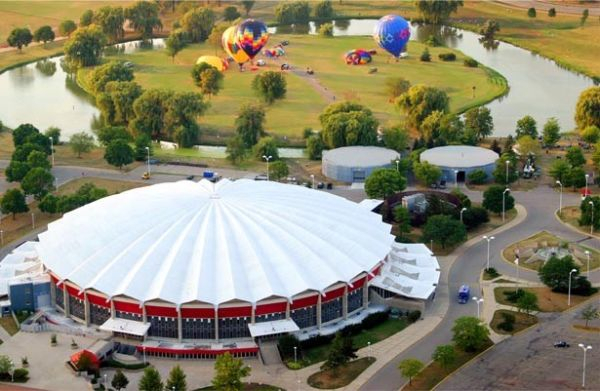 Doors will open at 5:30 p.m.
MADISON, Wis. (July 28, 2011) – Because of an inclement weather forecast, this evening’s Concerts on the Square performance will be held at the Exhibition Hall at the Alliant Energy Center (below) at 7 p.m. Doors will open at 5:30 pm. Rehearsals have been spectacular and guest soprano Susanna Phillips is not to be missed. It is Concerts on the Square as usual. The table area will be set up as usual, and others are welcome to bring lawn chairs or blankets to set up in the surrounding areas. People are free to bring picnic baskets, although NO ALCOHOL can be brought into the venue. Vendors will be available for food and beverage purchases. Parking at the Alliant Energy Center will be $6. “We welcome the opportunity to introduce Susanna Phillips to our audience, and are so pleased that we will be performing tonight’s concert” said Andrew Sewell, music director. This evening’s concert is a tribute to American composers, Gershwin, Copland, Bernstein and more, with guest artist, soprano Susanna Phillips.